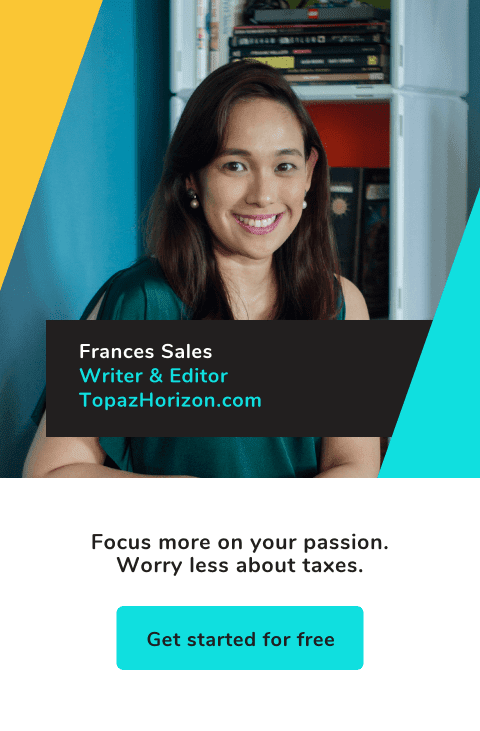 TOPAZ HORIZON: Secret Facebook photos! Dear heaven, I've forgotten about these pics! Was going through my Facebook yesterday and found some photos of myself--some unflattering (which I will not post here!). Oh well, that's what happens when you're not ready for the camera... or even if you are and you just happen to be having a fat day! Additional pic from the Kerastase event a couple of weeks ago. My pose is rather awkward, isn't it? Must be the camera and the shopping bag I was carrying--they were kinda heavy. Wine Night! 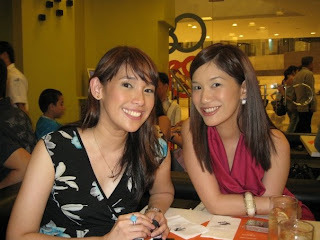 Every month, Kat Dy, Red de Leon, Nicole Delos Angeles and Nichole Reyes and I unwind and catch up over bottles of wine. I can only handle white wine actually as I'm allergic to red. I'm the one with eyeglasses. With each Wine Night, more and more people are added! I've met fascinating and weird people, true, but Wine Night is never boring as a result! 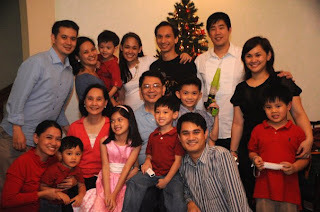 Christmas with my Sales family. Vince and I are on the top row, center. We're a happy lot! Lots of kids! Super noisy, super chaotic, super lots of gifts! This was taken last September. That's me in the short brown dress. 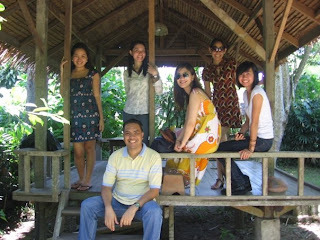 My staff and I went to the province of Quezon and we ate and ate ate. Crabs the size of dinner plates, prawns as big as your hand, fresh fish each more than a foot long. And that's just one meal. That was a food trip that went beyond what we can handle. Oh boy, I look so Chinese here. This was taken summer of last year. Nichole and some other media friends and I just attended the Marc Jacobs store opening and since there was no food (why do the organizers of fashion and beauty events always think we women don't eat? Or that we're all vegetarians? 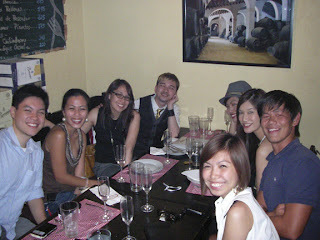 ), we converged at Cibo and ate and ate and ate. Anyway, I love my bangs and my turquoise ring! This was March 2008, I think. 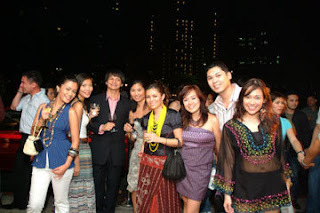 My friend Kate is about to open her store in Greenbelt 5 and this was her party. I'm wearing a Kate Torralba tube dress with the loveliest cherry blossoms embroidered all over the front. I have no idea when this was taken but based on my hair and the fact I no longer have braces, I'd say late 2007. 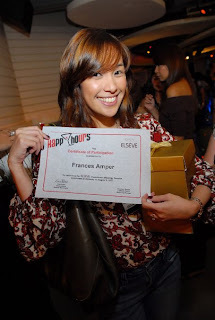 I had just learned how to mix drinks in a crash course by L'Oreal Paris. A paparazzi photo of me at my wedding in April 2007. 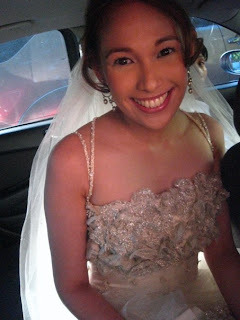 This was just before I stepped out of the Jaguar (loaned so generously by my sister-in-law's mother-in-law) and all my friends and bridesmaids were telling me to relax. Do I look nervous? No, baby. I was in the zone at this point! Ooh la la. 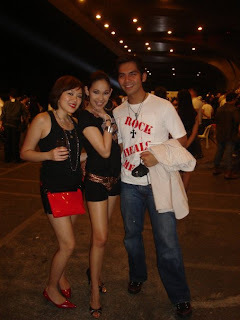 Me and my friends Mariel Chua and Jigs Mayuga at the Preview Ball 2006. My skin was soooo bad but Jigs--L'Oreal Paris Chief Makeup Artist!--fixed me up good. Gosh, I miss those legs! Oh my, this is Preview Ball 2005! 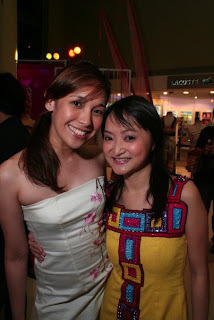 I am wearing a Kate Torralba sheer shirt with colored beading plus matching tube top and super short shorts. In 2005, I had no cellulite and I still had a waist so thank the heavens for this photo! I can show it to my kids one day and say, "See? Mommy used to be hot!" Thanks, Bucca! I still have tons of photos but I'm lazy to resize them!